The competition will take place in the main room, straight through the front doors. Please note that in the morning (between 8:00-9:30am), 3x3 BLD and 4x4 BLD will be going on and the doors will to the main room will be closed until these events have been completed. This competition is open to any and all competitors that would like to compete. There will be a 90-competitor limit so please be sure to register early, as spots are likely to fill quickly. There will be NO walk-in registrations accepted. Should registration fill up, you can be placed on a waiting list, in case someone else is unable to attend the competition. Please let us know at least two weeks before the competition if you are not able to attend the competition, so we can fill your slot with someone from the waiting list. Registration must be paid in full through the WCA Stripe payment system before you are officially registered. Make sure to pay after registering to ensure that a spot has been saved for you. You are viewing the schedule for the venue Colorado Springs Shrine Club. The schedule is displayed in the timezone America/Denver. Sunset Orange - Carolina Blue - Natural - Ice Grey - Gravel - Military Green. If you would like to reserve an apparel item(s) please send me an email with the size, color(s), and gear type(s) that you would like. Once I receive an email from you I will send you a invoice to pay through. All orders must be placed and paid for before midnight MST on Sunday, March 17th. 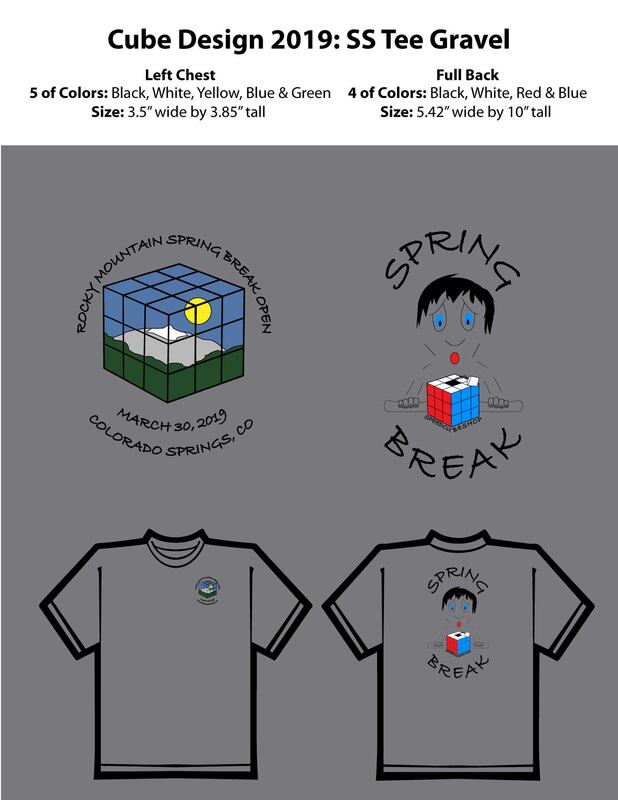 If payment is not received before the order is placed on March 17th, your very cool swag will not be included in the order. 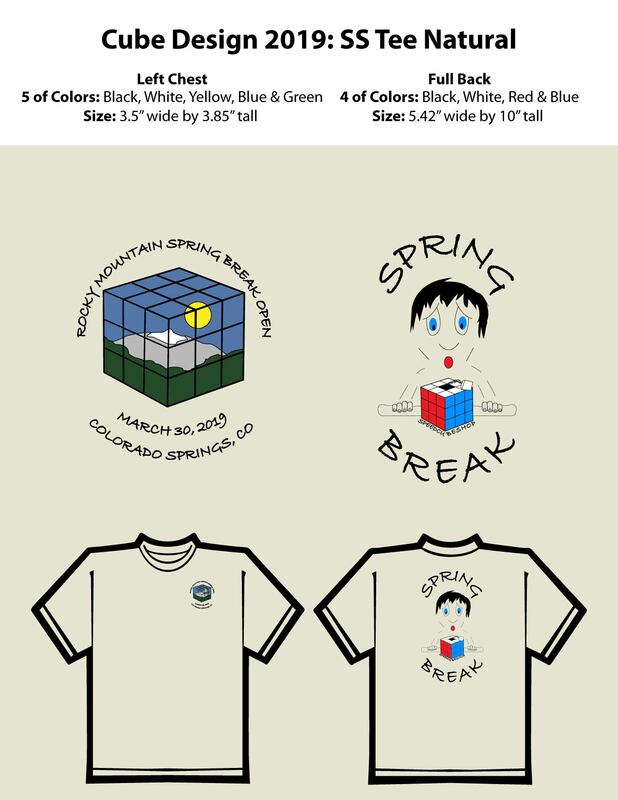 All gear is being made by Tees-in-Time in Colorado Springs, Colorado. The competition is being held at the Colorado Springs Shrine Club. The closest airport is the Colorado Springs Airport, which is a 22 minute drive to the venue. The closest hotels are: the Hotel San Ayre, which is a 2 minute walk to the venue, The Mecca Motel, which is a 1 minute drive or 8 minute walk to the venue, The High Country Lodge, which is a 2 minute drive or 10 minute walk, and the Garden of the Gods Motel, which is a 2 minute drive or 11 minute walk. The closest restaurants are: Dominos Pizza, which is right next door to the venue, Sonic, which is across the street from the venue, Margo's Vienna Station, which is a 5 minute walk from the venue, and Amanda's Fonda, which is a 9 minute walk from the venue. There is also a Safeway across the street. The venue is conveniently located close to both Old Colorado City and Manitou Springs, where you will find many shops and restaurants within walking distance of each other. Chicken Salad on Croissant- $4.00 Sm. or $5.00 Lg. 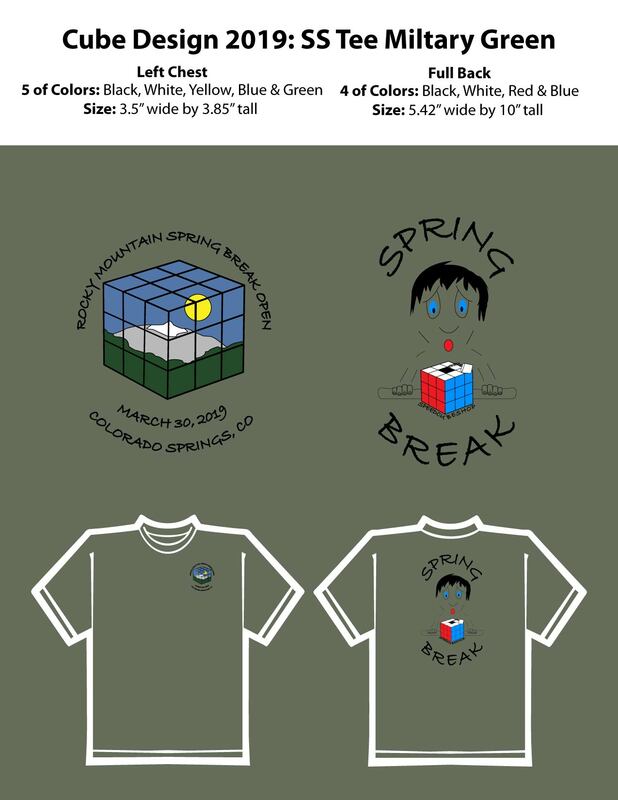 No tax will be added and the proceeds will benefit the Colorado Springs Shrine Club, which is a non-profit. A; Competitions are a bunch of tables where nerds like us get to sit and discuss our favorite thing, Cubes! Of course in addition there is competing, which will occupy one side of the competition hall, where you will see lots of timers flickering with contestants new personal bests. Most competitions have a break for lunch, and the competing is split up into heats, as to better organize who competes when.